Today's SCP has a more stand-alone creepypasta sort of feel, to the point that you may find it a little too similar in some regards to Candle Cove, but Candle Cove is almost ten years old at this point, which is practically a lifetime in internet years and more than appropriate time for a solid homage, if that is indeed what was intended here. In any case, it's a setup that I think still has a freshly frightening feel; the SCP itself is basically the fact that a place called "Cragglewood Park" does not appear to have ever really existed, but resurfaces in strange memories shared by a small portion of the human population. Most who remember the park can only do so dimly. Just dimly enough that they're not sure it was only a dream or a mixing of other memories from their early childhood. The park had only a single ride, a carousel, while the rest of the park is remembered as a forest of animatronic (or "animatronic") singing trees with goofy looking faces. Awkward, retro children's mascots and unintentionally alarming puppets have been an increasingly popular horror trend over these last few years, but I really feel like it has yet to wear out its welcome, especially if the genre is still treating clowns as objects of terror for some 30+ years now. A whole artificial forest of puppet trees and plants is an especially unsettling scenario to explore this way, and the final, grainy image in the final log is splendidly unwholesome after the buildup we're treated to. I'm just not so sure the initial drawing really works. I can't find who the original artist is, for one, so it's one of those SCP images that isn't properly credited. For another, it's clearly not meant to be a frightening vision. 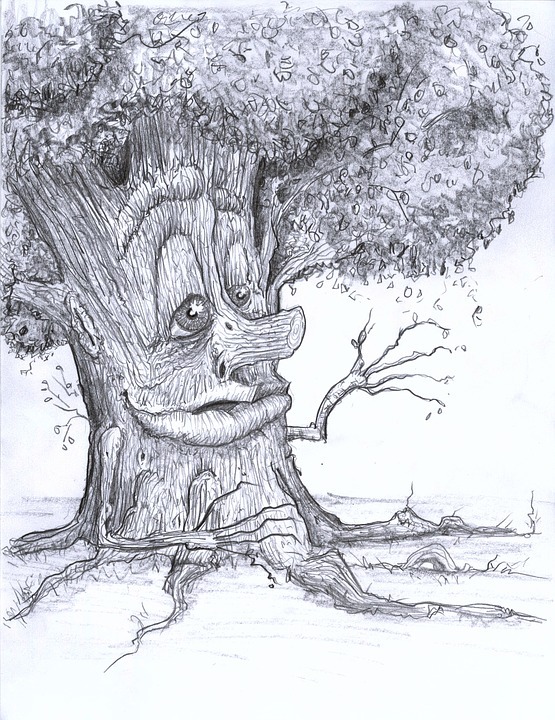 I think someone with these dark, nightmarish memories prompted to draw one of the tree-beings would come out with something much cruder and more uncanny, personally. The tale's biggest horror twist, I think, comes when one subject remembers a puppet tree sprouting right in front of them with their very own face, but it might have done better to come closer to the end or at the very end of the logs. All in all, I really love this one's setup enough to feature it, but I think it could still use at least a tad more refinement.